Every day, billions of new blood cells are generated in the bone marrow. The gene Myc is known to play an important role in this process, and is also known to play a role in cancer. Scientists from the German Cancer Research Center (DKFZ) and the Heidelberg Institute for Stem Cell Technology and Experimental Medicine (HI-STEM) have now found that just how big a role Myc plays is determined by a distant section of DNA that contains a cluster of gene enhancers. In certain blood cancer cells, this cluster has been altered, which affects Myc activity and thereby accelerates cancer growth and affects how the cancer responds to chemotherapy. 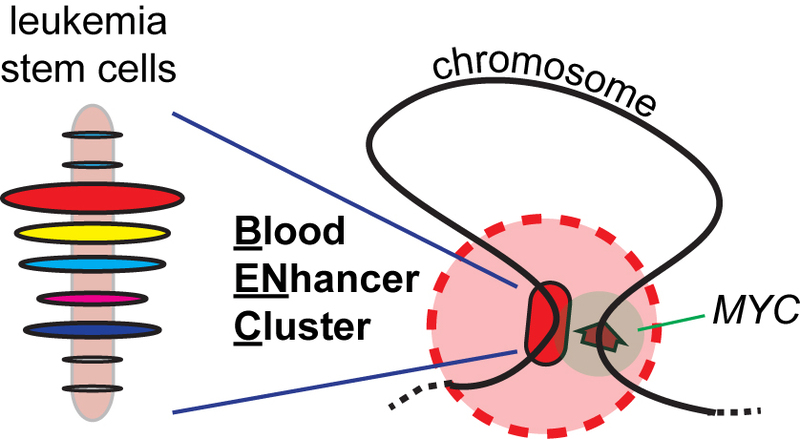 This cluster of enhancers might therefore be a suitable target in the treatment of blood cancer. The findings are published in Nature in collaboration with the European Molecular Biology Laboratory (EMBL) and colleagues from Canada. Every cell in our body is equipped with an identical genetic make-up, but each cell uses it differently. Specific proteins called transcription factors activate or suppress individual genes. "Thus, they facilitate the formation of all kinds of different cell types such as immune cells or blood cells, even though the genetic material is the same in all cells," said Andreas Trumpp from the German Cancer Research Center (DKFZ) and the Heidelberg Institute for Stem Cell Technology and Experimental Medicine (HI-STEM)*. Myc is known as a classic cancer protein. On the one hand, it functions as a transcription factor that is needed for normal blood formation from stem cells. On the other hand, it can lead to cancer if it is present at increased levels. However, the precise mechanisms of how Myc levels are controlled in each cell type have been largely unknown so far. Now a team led by Trumpp, jointly with colleagues from EMBL, has discovered a gene region that regulates the activity of the Myc gene in the individual cell types of the blood. The research team found that a cluster of gene enhancers called BENC is responsible for Myc's fine control. BENC is located in an area of the chromosome that is very distant from the controlled Myc gene. This cooperation works because the chromosome forms a kind of loop, thus establishing a direct vicinity of the enhancer and the Myc gene. BENC has a complex structure: It comprises nine individual enhancer modules that are arranged like beads on a string. These modules, which again bind different transcription factors depending on the individual cell type, interact in different ways in the various cells of the blood system. Thanks to this finely tuned interaction, each cell produces exactly the level of Myc that it needs for its optimum development. BENC regulates the varying Myc levels that are needed, for example, in blood stem cells or in mature lymphocytes. Having made this discovery, the investigators wanted to know whether BENC also plays a role in leukemia cells. In mice with leukemia, they were able to show that the cancer disappeared after silencing BENC. Carsten Bahr and Lisa von Paleske, who are the first authors of the study, have thus proven the fundamental importance of the enhancer cluster for this type of blood cancer. In cancer cells from some patients with acute myeloid leukemia (AML), the BENC cluster was multiplied and present in several copies. In other AML patients, only a single enhancer module was extremely active in AML stem cells. Both events lead to increased Myc levels in the cell and have an impact on cell division rates and, thereby, on response to chemotherapy. "Our results offer a possibility to better assess AML stem cells in the blood of leukemia patients," Trumpp explained. "As we already have therapy approaches to influence the activity of enhancers, BENC might even become a target for novel therapies against this type of blood cancer." *The Heidelberg Institute for Stem Cell Technology and Experimental Medicine (HI-STEM) is a partnership of DKFZ and the Dietmar Hopp Foundation.